LAKE BUENA VISTA, Fla. — During a media event on Wednesday, Walt Disney World offered a preview of several attractions opening this summer and a sneak peek at additional attractions expected to open over the new few years. Disney can’t — and won’t – let it go. 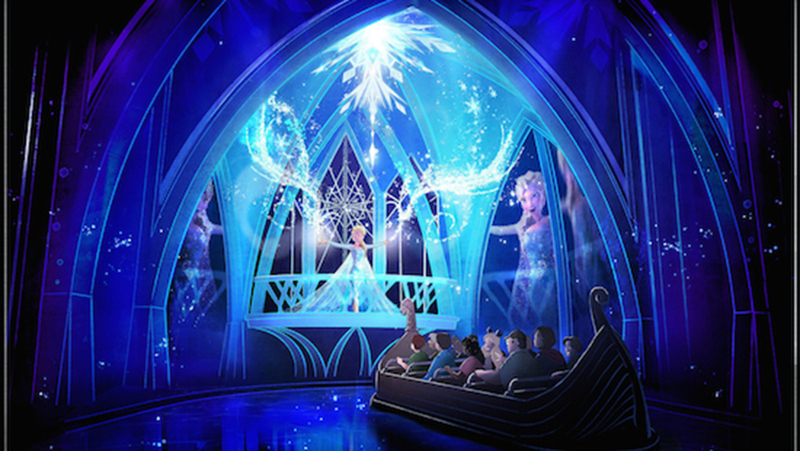 The Frozen Ever After attraction currently under construction at the Norway Pavilion in Epcot will open this June, Disney revealed on Wedsday. A new boat tour will take guests through Arendelle as they participate in a “Winter in Summer” celebration in a newly created story that takes place after the film. Guests will then have the opportunity to meet Anna and Elsa in a newly opened “Royal Somerhaus” meet-and-greet location. Disney brought back composers Bobby and Kristen Anderson-Lopez, who worked on the original film, to help with new music for the attraction. Walt Disney Imagineers also traveled to Norway to research architecture, décor and artifacts used in the attraction. While Disney is celebrating Star Wars with a brand new fireworks show and other attractions this summer, most fans of the film are interested in what’s coming in a few years. On Wednesday, Walt Disney World shared photos and videos from the upcoming Star Wars Land to be built at the current Disney’s Hollywood Studios theme park. On Memorial Day, a third track will open for the current Toy Story Mania track at Disney’s Hollywood Studios — which will help with long wait-times if you’re headed to Orlando this summer. The new Toy Story-themed Land and attractions will open at a later date. Animal Kingdom Park introduces several new nighttime attractions including a new night safari, a nighttime show dedicated to The Jungle Book, and a new night version of The Tree of Life. “The Tree of Life Awakens” uses projections to make the tree appear to come to life at sunset and throughout the evening. Animal spirits and fireflies are projected on the tree, in addition to some Disney favorites. The “Jungle Book: Alive with Magic” Show will be limited-engagement show that will serve as a placeholder for the Rivers of Light nighttime show that has been delayed. The safari, Jungle Book show, and night version of Tree of Life will all debut on Memorial Day. The Rivers of Light show was scheduled to premiere on April 22, but the show was delayed due to technical issues. When the show is ready for guests, the show featuring The Jungle Book will end its limited-run and the Rivers of Light show will make its debut. However, no timetable was provided. A new stage show at Magic Kingdom Park titled “Mickey’s Royal Friendship Fare” will begin performances in June. The show replaces the “Dream Along with Mickey” show which ended its run earlier this month after premiering in 2006. Starting early next month, characters from the upcoming film “Finding Dory” will make appearances in the current “Turtle Talk with Crush” attraction at Epcot. The film hits theaters on June 17. Princess Elena, Disney’s first princess inspired by diverse Latin cultures, will make her debut at Magic Kingdom park in August. And last but not least, Disney Springs, formerly known as Downtown Disney, will open 30 new shops and restaurants when its new “Town Center” opens to guests in mid-May.